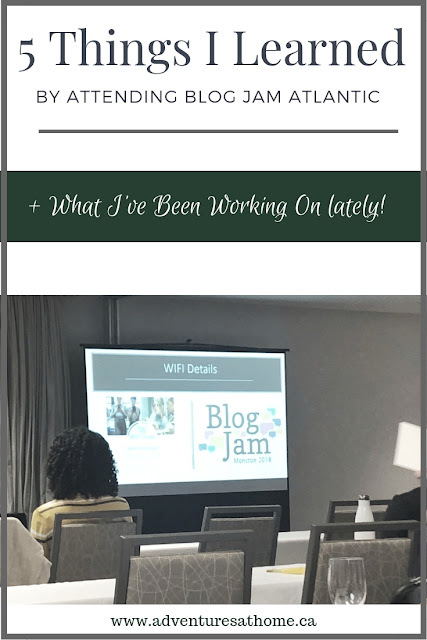 At the end of October, I attended my first blogging conference, BlogJam Atlantic. I wanted to talk a bit about my experience, and tell you what my plans are for the future! On the morning of BlogJam, I woke up at 4am to get ready, and left Fredericton around 6:30am. The conference was in Moncton at the Delta Beausejour Hotel. I was nervous to be attending the conference alone, but excited to learn, mingle and network at the best of my ability. Once I got there, I quickly began to recognize faces and names of bloggers that I've been following for years. A lot of them knew each other already, so it was a bit intimidating, but everyone was very welcoming and friendly. I won't go into detail about the specific speeches and presentations that I watched, because I could honestly go on forever about what I learned on the blogging side of things. I hadn't realized quite how important networking was before attending BlogJam. I felt like a bit of an outsider even though I had been talking to these people online for the past couple of years. After BlogJam, I committed myself to making new friends in the blogging/social media world. I've been talking to more people online, making coffee dates, and genuinely working hard to find my "people". So, my birthday is next month, and I'm turning 29. I often get the feeling like I should be farther ahead in my career, or like I haven't accomplished enough in my 20s. BlogJam showed me that you can be who you want to be at ANY age. Surprisingly, most people in attendance were around my age or older. Many of the people there have been building up this career for years, but many were still in the early stages, like myself. It was really comforting and reassuring. If you've had an idea in your mind for years, if you've been thinking of starting a blog or a business, JUST DO IT! Life is too short to not act on your ideas. Great things can come from just going for it, and you'll always wonder what would have happened if you didn't. One main thing I took away from BlogJam was that in order to gain any kind of success with blogging, you need to treat it like a job- because it is. Unfortunately many of us have full time jobs on top of blogging, but the main thing is to stay consistent and keep pushing forward. If you want to make blogging your full time job, it's absolutely possible with hard work and determination. This was something I learned not only from the presenters, but also from the people in attendance. I was able to meet a lot of great bloggers while there, and heard stories about a few failed blogs or businesses. The common theme in all of these stories? They didn't give up and created a new blog or business that became successful. I have been working very hard at creating a new business that will launch (fingers crossed) on my birthday next month! I'm in love with the website I've created for it, and feel it's one of my best projects yet. It doesn't feel like anything else I've ever done, and I'm hopeful that it will be a success. It's nothing like anything I've launched before. Usually I'm quick to announce things and post them, but this website has really been a labor of love and I can't wait to have it ready for you guys to see. I will go into further detail in another post, but it's basically a website offering services for social media management, consulting and virtual assisting, with a corresponding blog that will focus on those topics, along with female entrepreneurship. I have closed my Etsy shop to all orders aside from printables so that I can focus my time on work that corresponds with the writing and social media management that I'm already doing and loving. Part of me was nervous to announce this, as I have a lot on the go, and I don't want people to see this as just "another one of her projects". Everything I do is leading me one step closer to my goal of working from home, and this is more than a project. This website is taking my current side hustles to the next step, and in the right direction. I honestly have never been so certain or excited about launching something!